Oil prices have continued their ascent driven by favorable economic and supply data. Though some sources suggest that prices may not move much higher, OPEC's own forecasts show a scenario where it very well could. In all, if current trends persist, there will be a sizable drop in crude inventories this year, which will be good for prices. Right now, global oil markets seem ecstatic. A big source for this enthusiasm is courtesy of OPEC, the massive oil cartel that has been working diligently to establish balance in the markets and prop up prices in the process. The end result, so far, is turning out well for oil bulls, as plummeting output from the group points to, at worst, an almost balanced market for crude this year and, at best, a scenario where inventories are far too low for a glut to arise come the start of 2020. Either way, investors in this space should be happy with current conditions and any company that benefits from higher oil prices should be considered a viable prospect. According to OPEC’s monthly report, the amount of oil produced by the group in the month of March plummeted compared to where it was in prior months. In the image below, for instance, you can see that crude production from the group came in last month at 30.022 million barrels per day. This represents a decline of 0.534 million barrels per day from the 30.557 million barrels per day seen a month earlier and it helped bring the first-quarter average from the group down to 30.45 million barrels per day. Leading the path in declines, unsurprisingly, was Saudi Arabia. According to the data provided, the nation’s output fell 0.324 million barrels per day in March, falling from 10.118 million barrels per day to 9.794 million barrels per day. Other nations posting big declines included Iraq, which reported a drop of 0.126 million barrels per day, and Iran, which reported a drop of 0.028 million barrels per day. The decrease from Iran should not be surprising given sanctions and the fact that some nations that had received waivers from the US regarding output have been scaling back their purchases. The only country to post a sizable increase in production during the month was Libya, with output rising 0.196 million barrels per day from 0.902 million barrels per day to 1.098 million barrels per day. This could, however, be temporary (as could the drop in Iraq) because of militant activities within the country. Aside from Saudi Arabia, the country that posted the largest decline in production was undoubtedly Venezuela. During the month, Venezuela’s production came in at 0.732 million barrels per day, down 0.289 million barrels per day from the 1.021 million barrels per day seen a month earlier. This is the largest one-month drop I have ever seen from Venezuela, and while some of the decline may be temporary thanks to blackouts that have negatively-affected the South American nation, most of the drop will probably remain in place for the long haul due to a collapsing economy and heightened international sanctions against its government by the Trump Administration. In all likelihood, output will continue declining there for the rest of this year. It’s worth noting that Venezuela even acknowledged the drop, with its publicly-announced estimates showing output falling 0.472 million barrels per day from 1.432 million barrels per day to 0.96 million barrels per day (their numbers have always been more attractive than the OPEC-estimated ones). Looking solely at the first quarter of this year, it’s clear that there was a build-up of oil. According to OPEC’s own estimates, total commercial oil inventories among OECD nations last year ended at 2.873 billion barrels. The amount of excess production in the first quarter of this year came out to 0.43 million barrels per day. If all of this went to OECD nations, then it would imply inventories today of around 2.912 billion barrels. As you can see in the table below, this would translate to about 60.74 days worth of supplies among OECD nations. Generally speaking, a glut is signified at any measure north of 60 days worth of supply. This, then, would imply a glut today of about 35.48 million barrels. While this looks bad in and of itself, if OPEC continues to produce at the level seen in March and that lasts for the remainder of this year (I suspect production will continue declining, so this is a conservative assumption), and if all excesses or deficits are reflected in OECD inventories, then by the end of 2019, we should see stocks of around 2.809 billion barrels, about 64 million barrels lower than last year’s end. Given growing OECD demand, this should result in output that is about 91 million barrels shy of hitting glut territory, with the trough hitting 146.10 million barrels shy of it at the end of the third quarter this year. This does not necessarily mean that we will be in a state opposite a glut, but it will mean we have some nice wiggle room should estimates prove to be wrong and we should see oil price at rather attractive levels ($65 to $75 per barrel for WTI, I believe). In the same table, you can see the same analysis repeated, but this time in a world where any excesses or deficits are reflected only in half in OECD nations. After all, the oil market is a global one, and just less than half of all of it consumed this year will be among OECD nations. 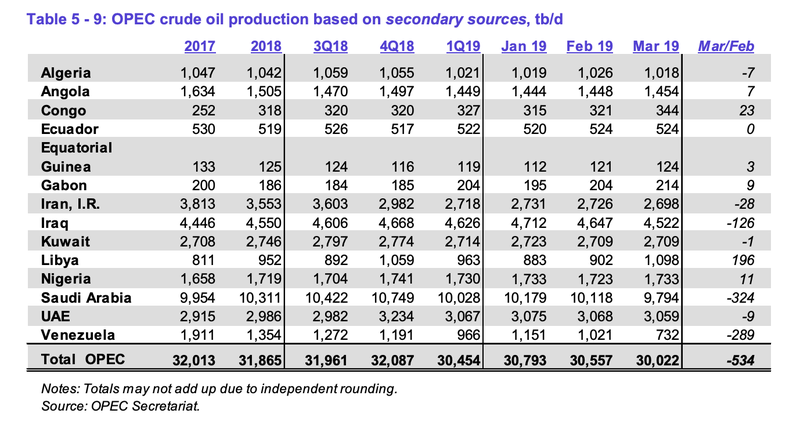 In this scenario, the picture does look less attractive on the whole, but we would still be around 59 million barrels shy of being in a state of glut. I would still consider this to be a very attractive outcome for bulls. One interesting tidbit to be aware of is that all of OPEC's estimates assume that Russia’s oil production this year will average 11.54 million barrels per day, up from last year’s 11.35 million barrels per day and just shy of the 11.61 million barrels per day they estimated for the nation’s fourth quarter last year. If Russia were to abide by its OPEC+ agreement entirely, and if those cuts extended through 2019, actual output would be around 11.2 million barrels per day, but due to the slow progress they made toward achieving them in the first quarter, a more realistic number might be 11.3 million barrels per day. It’s possible Russia could forsake OPEC this year and that scenario seems to be priced in, but if the nation does produce, instead, around 11.3 million barrels per day, that would remove a further 87.6 million barrels from the global market. At this moment, oil investors should be bullish… very bullish. So long as OPEC continues to stick with its production agreement, and so long as there are issues involving Venezuela, Iran, and Libya, there is a very high probability that the market will be, at worst, balanced this year, but a more likely scenario is that we’ll see inventories fall year over year. A major economic downturn could change this picture, but absent that happening, I don’t see any likely scenarios where oil bulls end up ending this year in a bad position.